The addition of small trees and shrubs to a landscape is a great way to increase curb appeal. Shrubs also are a good option for privacy and to hide ugly elements of a home. However, some shrubs that you can add to your property have leaves and other parts that are edible. You do not need to settle for standard plants when you can have edible shrubs. Edible shrubs can easily be added to a flower bed or an existing garden. 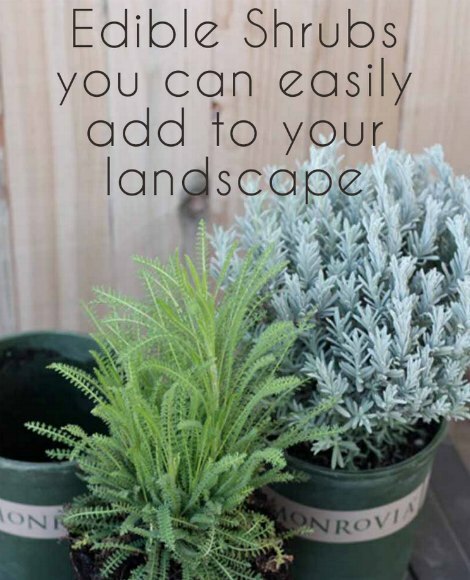 You can even place them in an updated area of your landscape. The first thing to realize when you want to add edible shrubs onto your property is to decide which ones to plant. There also is the space that is available for the various shrubs that you may be considering when you want to update your landscape. The best edible shrubs will be a small plant that produces berries or fruits. There also are various types of shrubs that are of a herbal variety. This means you will have many plants that will look beautiful when added to a landscape and can be used as a source of food. Many people may not know they can plant edible shrubs almost anywhere. They do not necessarily need to be placed in a garden or a dedicated area in your yard. If you do not have a good area for your plants, then a large container is an option to consider. Many people who have a deck or patio will keep plants in a pot or other container to grow herbs and even vegetables.